Forget about “quantum computing” for a second, and just consider the smallest particles. Particles take on exact values of certain innate properties, the way coins are either heads or tails. But unlike real coins, you can prepare particles so they encode both the values of “heads” and “tails,” each with some complex number (like a+bi) associated with it. This is only meaningful after you prepare the particle in that state, and before you measure it again. Every time you measure it, you’ll always get just one of the choices. But if you prepare and measure the same state lots of times, you can glean some information about it. If you have two particles, then you can have them interact in a such a way that they are entangled. Even if you separate these particles by great distances, they remain entangled, an effect that Albert Einstein called “spooky action at a distance.” Now, the complex numbers describe combinations of both particles’ properties, so one particle cannot be explained without the other. You can tell whether these particles were entangled based on mathematical correlations that would come up during repeated resulting measurements of them. If you think of each of those two-state systems as a weird computer bit, and allow these bits to entangle, then you can generate strange new quantum-only correlated statistics when you measure them. Combined with another topic called quantum interference, this allows for new kinds of devices that can perform computing algorithms that regular computers wouldn’t be able to do. But entangling a lot of particles together and keeping them entangled while still being able to control the individual qubits has been exceedingly difficult. Lanyon and others are now demonstrating a device with qubits as 20 calcium ions arranged in a line. In these atoms, the outermost electrons can be in one of two places, with the two places effectively representing the one and zero of a traditional computer bit. The scientists measure which state the atom is in by whether it fluoresces (glows under an added energy source) or not. They entangle these atoms’ states using a series of lasers. The experimenters watched as all 20 atoms entangled with two other, three other, or even four other neighbors. They were able to individually manipulate and measure each qubit, according to the paper published in Physical Review X. This shows just how much work there is left to do in the world of quantum computers. 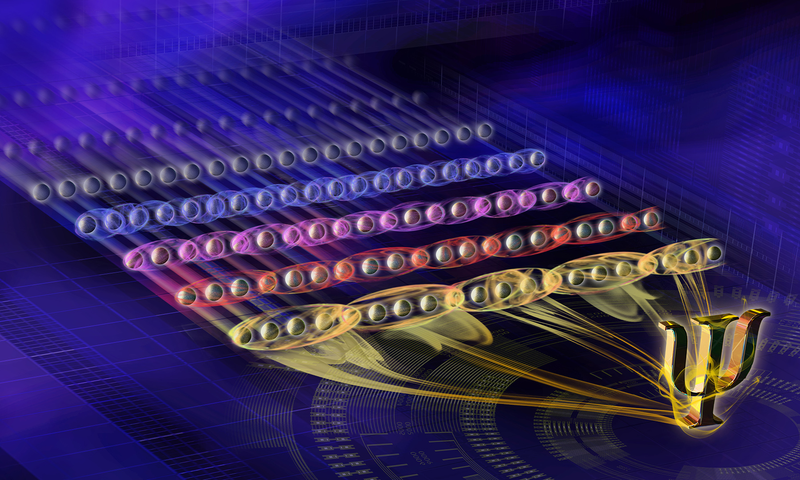 Other researchers have announced computers using a similar technology with 51 or 53 qubits. Google has one that it hasn’t quite tested yet with 72 qubits, and D-wave flaunts their 2,000+ qubit machine, but it’s a very specific kind of quantum computer that might not be any faster than a regular computer performing the same problems. I asked IBM about its own quantum computers: “We haven’t performed the same experiment on our IBM Q devices and we are not yet releasing data from our 20-qubit device,” Sarah Sheldon, an IBM quantum computing researcher, told Gizmodo. A similar experiment was done on the 16-qubit cloud device by an external group that was able to entangle all 16 qubits, she said. If you want the truly universal quantum computers that futurists dream of, you have to be able to entangle the qubits. “A key demonstration of growth in the performance of quantum computers is not simply the ability to fabricate more devices, but rather putting many qubits to work simultaneously,” Michael Biercuk, professor of quantum physics at the University of Sydney, told Gizmodo. Additionally, many of the leaders of the pack, like Google and IBM, make their quantum computers using highly engineered superconducting circuits, instead of single atoms. This demonstration is a win for systems that rely on atoms in different states as their qubits. This experiment also demonstrates some of the most exotic quantum systems ever made, said Lanyon. He’s particularly interested in nearer-term physics experimentation: testing the limits of quantum computing in the lab, instead of with theory. Needless to say, others thought this advance was important. “It is one step further towards small scale, general-purpose quantum computers” made from trapped atom systems like these, University of California Merced physicist Lin Tian told Gizmodo. We’re inching closer to useful quantum computers, and have gotten excited about a number of announcements around big quantum devices. But this 20-qubit machine highlights, once again, that there are lots of things beyond qubit count that must be taken into consideration.